Previewing all fonts installed on the system can have two benefits. The first is a quick overview of the installed fonts. The number of fonts installed on the system becomes immediately clear and since you see a preview of every font with a test sentence you can quickly evaluate if a font is really needed on your system which is especially valid for "fun" fonts like the Terminator font. A better use of a software that displays all fonts installed on the system is the overview to be able to pick only quickly for a presentation, letter or other purpose. Or could you name the differences between Arial, Times New Roman and Franklin Gothic Medium out of your head ? You could obviously just test them in the application that you write the text with but this usually takes way longer. Hawkeye Font Browser is a free software for Microsoft Windows that requires the .net Framework 1.1. It's a tiny 39 Kilobyte application that can be run from any location and immediately displays a sentence in all fonts installed on the system. The user can enter a different sentence and pick a font size, color and select bold or underline letters. By the way, if you have more than 100 fonts installed on your system you might want to consider reducing them to speed up system boot times. Check out the article fonts increase system startup for additional information. How about NexusFont 2 RC3? It is my one and only tool for Windows font management and pre-viewing just got better. I don’t think there is any faster and easier to use tool to catalog, sample-print and view the fonts installed on a Windows system. It is easily made “portable” to run on a USB stick. 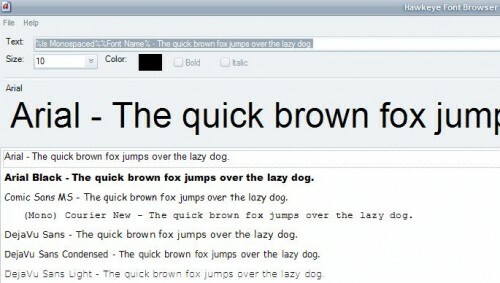 I have a great deal of fonts on all my systems, and picking just the right one from a little drop-down field in Office just bites. This satisfies my font-management hunger! I haven’t even downloaded this program yet. What do you want me to say?